Home » Blog » Looking for a romantic & stylish retreat close to Athens? Located within the Saronic Gulf and only 54 nautical miles away from Athens, it combines the cosmopolitan air of Greece along with the traditional character that it has managed to preserve throughout centuries. Being one of the well-known cosmopolitan destinations, it attracts famous celebrities and guests every year. In 2010, for example, Spetses got much of the media's attention for hosting the royal wedding between Prince Nikolaos and Tatiana Blatnik. At the same time, Spetses is also well-known for the absence of any private cars on the island, as bringing or driving cars there is banned. The main means of transportation for guests are motorbikes, quad bikes (4 wheelers) and public bus transportation that operates on routes to the main beaches. If you are into quad bikes, you will find them very convenient since there will be no cars in your way. And last but most exciting, the island is famous for offering rides in traditional horse-drawn carriages. Picturesque coachmen can take you to most parts of the town of Spetses, from early morning until late at night during the summer season. The main port of Dapia as well as the Old Harbor consist tourist and commercial centers. 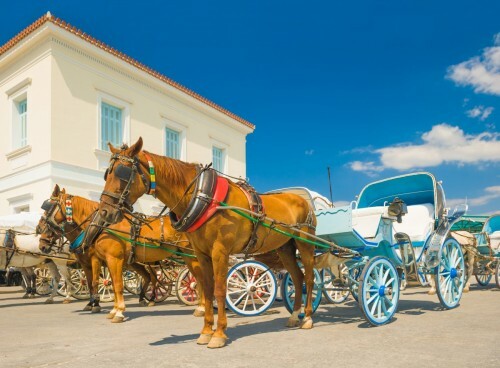 Spetses island is also nationally honored for its significant contribution to the 1821 War of Independence and to the liberation of Greece from the Turkish occupation. access to the Cave of Bekiris, a gorgeous secluded cave with impressive centuries-old stalagmite and stalactite formations. Last but not least, I have to refer to the beautiful beach of Zogeria, which is located within a cove, covered by a pine forest. The advised and easiest way to reach this place is by taxi boats. You can, though, reach it through an unpaved route with your chosen vehicle, but the route is not convenient, quite bumpy and not recommended. Of course there are many other beaches in the island, waiting for you to explore them. Some of you probably already liked the whole idea of an exotic escape to Spetses and you are now wondering when is the best time to visit the island. 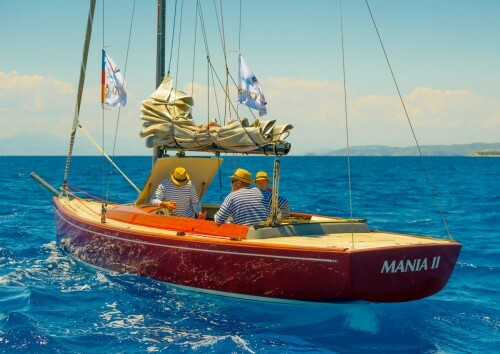 A great time to do so is during September, when a truly impressive re-enactment of a naval battle called "Armata" takes place every year, since 1931, and promises to enrich your Spetses experience. 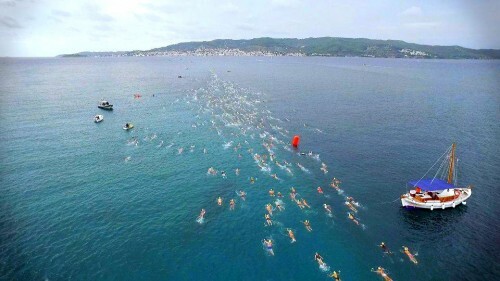 Spetses also provides opportunities for walking tours, boat trips, and of course, wining, dining and partying. For reaching Spetses, you can rent a car from Athens and take the national road, cross the Isthmus of Corinth and take the exit to Ancient Epidavros. Then, drive through Kranidi, Porto Heli and Kosta. The drive takes about 2 hours and 30 minutes. From Kosta, a sea taxi will take you to Spetses in 5 minutes. On your return from Spetses you can also visit Nafplio, a picturesque seaport town located within half an hour drive from Spetses island. Nafplio is known for being the first capital of Greece, from the beginning of the Greek revolution in 1821 and until 1834. Even the Greeks recognize that it's the most beautiful of all mainland towns, with its numerous Venetian and Turkish buildings. Palamidi is the fortress that dominates the city, in the sense that it almost floats on a steep hill (216 m) over Nafplio. To reach Palamidi, most people say that you need to climb 999 steps, but it's actually "only" 857. The walk is well worth the effort. The most photographed monument of Nafplio, though, is the small Venetian fortress of Bourtzi, standing on the rocky islet of Agioi Theodoroi. Between 1865 and 1935 Bourtzi consisted the executioners' residence. 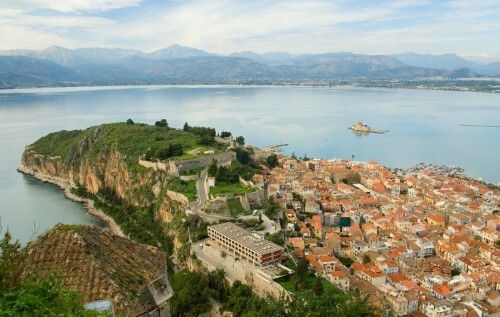 Lately, it’s purely a tourist attraction, and has become the symbol of Nafplio. There are small boats heading out to the fortress, leaving from the port regularly during the day. The ride lasts only a couple of minutes. However, Nafplio's oldest castle is Acronafplia, an old Venetian fortress overlooking the old town of Nafplio.